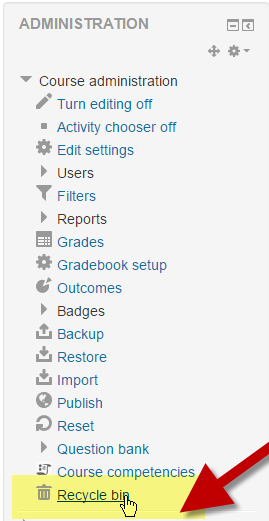 (STAFF) How do I find material that has been deleted from my Moodle course? 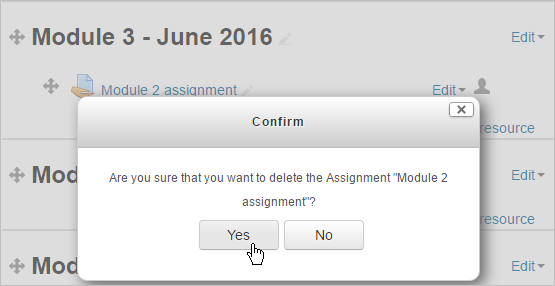 If you mistakenly click 'yes', all is not lost. After a short while, a 'Recycle bin' link will appear in the Administration block. or appears when you click on the Settings cog. There is a delay in the 'Recycle bin' link appearing or deleted material appearing in the recycle bin. Click the Recycle bin link and then click the 'restore' icon next to the item you accidentally deleted.